Rain transforms into snow when the temperatures drop below freezing, right? Not necessarily. Supercooling raindrops is really what’s poking these cookie-cutter holes in the clouds over the southeastern United States. Everyone knows water freezes once temperatures drop to 32°F (0°C), but that’s one of those little lies of oversimplification we use to skip messy details. In reality, contaminants like dust or pollen can drop water’s freezing point. The result is supercooled raindrops can chill below freezing, while remaining liquid. 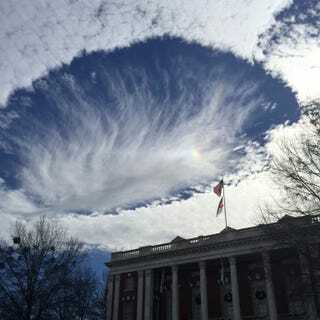 The skies over Mississippi and Louisiana were blanketed in supercooled clouds this week, but not thickly enough to ground planes. When aircraft darted through the cloud deck carrying holiday travelers, they cooled the clouds even further through a trick of aerodynamics. Pressure drops as air flows over the wing and propeller tips, allowing air to expand while dropping in temperature. This adiabatic cooling is enough to drop the temperature by up to 68°F (20°C), well past the point where even supercooled droplets freeze into ice crystals. When these ice crystals encounter still-liquid supercooled droplets, they act as nucleation points triggering further crystallization. Soon it’s a tiny storm, a miniature burst of snow or rain leaving a gap in the cloud layer. These fallstreak clouds can be polkadot hole-punches or longer canals depending on the interaction of the thickness of the cloud layer, degree of wind shear, and air temperature. This week, conditions came together perfectly. A perfect cloud deck, supercooled droplets, and a busy season of constant travel poked holes until the sky started to look like swiss cheese. Supercooling is gorgeous.